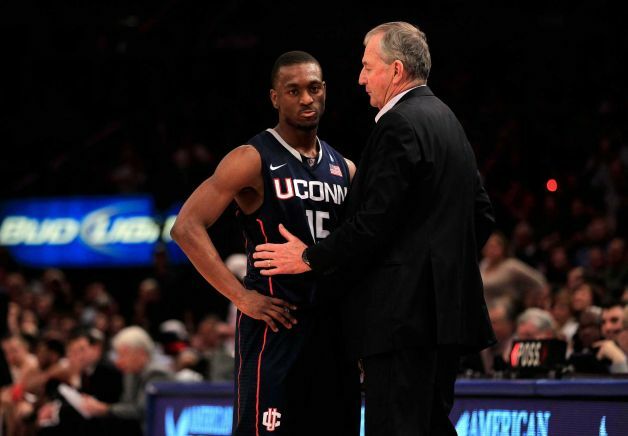 One of the biggest challenges in producing the documentary Born to Lead: Jim Calhoun was figuring out how to tell the story of Calhoun’s record seven Big East Championships at Madison Square Garden. With ESPN/ABC charging close to $13,000 per minute for footage, we had to be very selective in choosing the critical film clips. Was there a way of making the segment more economical and more personal by enlisting the help of Jim Calhoun? Suppose we had him come to Madison Square Garden and reminisce about his greatest moments in Big East history from the spot on the floor where the moments took place? That would solve part of the footage issue and bring the segment more to life. But there would be considerable logistical hoops to jump through before the camera rolled. The Garden was undergoing a billion dollar renovation and wouldn’t be available for nine months. Jim was recovering from knee surgery and might not be able to walk around an empty Garden let alone make the three hour trek from Connecticut to the Big Apple. UConn was only scheduled to visit the Garden once in 2014 for a tournament so if this was going to become a reality, we had to get Jim on that UConn team bus. With permission to shoot at the Garden secured and Jim agreeing to come to New York, we were half way home. There were two corporate basketball games that began at 7:00am and we had to wait until they were finished. No wiggle room at all. On the back end, the four teams playing in the tournament began practices at 10:00am. And once that first team took the floor, the rest of the day was booked solid. So we had to squeeze in the shoot after the corporate games and before the first practice by Boston College. Credentials were secured the night before after finally tracking down the media relations contact around 8:00pm. Jim met us at the security entrance at 8:30am as planned. Now we just had to pray that the second corporate basketball game ended with enough time for us to shoot seven different locations on an empty Garden floor. At 9:25am, the last game finished. It took me about 15 minutes to clear the court. Then, it was the attack of the leaf blowers as the cleaning crews took over. I begged them to hold off for 20 minutes so they wouldn’t be in the shots or ruin our audio. All obliged but one. If you look closely in one of the last shots of Jim sitting on the sideline, you’ll see a maintenance worker with the leaf blower in the far right hand side of the frame. We began shooting around 9:35am and finished at 10:00am on the dot! As Jim walked off the Garden floor and into the tunnel, he passed the Boston Garden players along the way. It was that close. As soon as the clock struck 10:00, we were all gently reminded to leave the court, immediately! Jim was amazing, especially given that he’d never done anything like this before and there was NO rehearsal. We shot seven stand ups in 25 minutes and almost all were in one take. Jim “one take” Calhoun had delivered the goods once again at his favorite arena on earth.